I look at the “fact checking” movement and recent partisan / political disputes over it, and suggest a need to go beyond principles of objectivity, and to embrace political strategy, learning theory, and empirical evidence about how to have impact. As recently commented by political organizer Biko Biker, the first rule of effectiveness is: meet people where they are. It’s been a not-so-quiet few weeks in Lake Wobegon — the world of journalistic fact-checking, that is: the practice of examining news stories, politicians’ statements, etc., for factual accuracy. 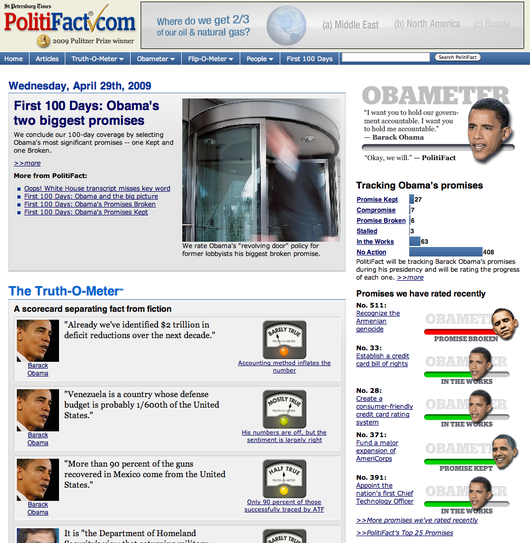 It’s familiar to many from the syndicated newspaper columns of Politifact, launched in 2007 (their Web site shown at left). It’s also done by other organizations such as AIM and FAIR, and TV news programs, and is joined by many related Web projects such as Hypothes.is, a proposed “peer review layer for the Internet,” and “Truth Goggles” from Dan Schultz at MIT. 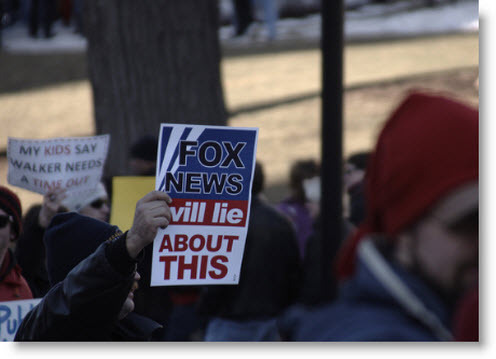 The other week a major shot across the bow was fired by conservative magazine The Weekly Standard‘s with its cover story, “Lies, Damned Lies, and ‘Fact Checking’: The liberal media’s latest attempt to control the discourse” by Mark Hemingway. The title sums it up quite well, but basically Hemingway reviews the rise of fact-checking, rips apart a few choice Politifact and Associated Press fact-check pieces, and observes an overall liberal-Democratic agenda in the enterprise. [The Weekly Standard‘s piece] is basically an argument for endless epistemological war….In this scenario, nobody will ever know the “truth” because it cannot meaningfully exist until one side has defeated the other…. Along similar lines, my friend Alec Macgillis writing in the The New Republic argues that “fact-checkers wouldn’t be needed if all of us journalists were more able, willing and empowered to do our jobs: to vet and explain political claims as they were being made.” I can’t help but feel this is essentially nostalgic: wishing for a day when there was (if there ever was) an ample supply of well-trained, well-resourced, well-respected professional reporters to give every topic its thorough, balanced, due. Here, I would have to to agree with Clay Shirky’s recent volley in the CJR “future of journalism” fray, “Institutions, Confidence, and the News Crisis” and say that this just isn’t a choice any more, that such a system is economically and technologically and politically past tense. Even if there were an economic climate to support such a professional journalistic cadre deployed on every story, I think that today, it wouldn’t even assure success. Why? Because man is a political animal, ours is a political world, and journalistic fact-checking must, like it or not, have a political strategy if it is to escape political neutralization. This does not mean that fact-checking must have a political position. Rather, I think that proponents of fact-checking must recognize that if you want to influence public opinion, you have to prosecute the cause through the mechanisms of public opinion, and this IS fighting the good fight. Taking refuge in high principles of neutrality and independence may be dignified, but if it’s ineffectual, if you lose the war, it’s cold comfort. To be fair, fact-checking projects are doing much to increase their appeal and effectiveness, e.g. the humor of Politifact’s “pants on fire!” negative rating, or annual “worst liars” awards. But I’m not sure that many partisan boundaries are yet being crossed. Do Politifact columns disproportionately critique Republicans? Perhaps your objective method objectively found greater incidence of falsehoods in Republican speeches, according to rigorous truth goggles software or peer review. It doesn’t really matter. If prevailing media, and most of the audience, might easily dismiss you by the fact that Politifact gives more lower grades to Republicans, say, then figure out a new angle that will be more effective in the war. Even patterns of who reads and cites your findings can be used as evidence of bias. . Protesting your objectivity may do nothing to reach the unconverted. A model for analyzing fact-checking projects — for impact, interaction, and topical foci — was recently shown by John Kelly of Morningside Analytics. His research, summarized by Ethan Zuckerman, shows that fact-checking sites differ significantly in what communities they reach, and how much they reach into different political territory. See also his fascinating visualization of the blog network Global Voices Online, with auto-classification of sources by topic focus, dot size to represent traffic volume, and graph of linking patterns between sites. This is intriguing, but we might go a step further, and investigate how much fact-check information actually affects, or might affect, people’s understanding. Here we could look to cognitive science and learning theory’s findings/methods regarding how people revise/improve their understandings. These approaches might be entirely counter-intuitive, from the standpoint of traditional journalistic: e.g. might suggest giving less information or fewer source choices; or creating certain types of temporary confusion or dissonance or “meaning threat” (see Psychological Science paper PDF, or summary). Personally, I have a hunch that the greatest hope for building media that will change minds lies in personalized media, e.g. that would look for deficits in your reading matter / social graph and try to address them. There is some interesting research showing that many, if not necessarily a majority, of news readers actually express interest in and report higher satisfaction with such “balancing news,” but more on this point in later installments. I think it’s virtually impossible to depoliticize political media with pure fact-checking. The treachery of politics and public opinion will relentlessly undermine a too-idealistic enterprise, and merely presenting critiques doesn’t necessarily reach people or change their minds. Don’t be sloppy, in any way, ever. It’s fatal. Continual self- and process examination. Never trust trust (see note #1 below). Realize that it’s not just about “facts”, it’s also about narratives and mythic/cognitive frames. One’s framing concepts of “factual” or “truthful” may not be the same as everyone’s. That doesn’t mean there is no objective reality, just that people understand reality through quite different frames, and you must think about how to communicate through those frames. Fulfilling our own ideals and impressing people who think like us is seductive but insufficient. Perhaps focus might be shifted towards hard evidence of how much we are changing minds and crossing partisan / concept-cluster boundaries. For example, a) quantitative media analysis such as that cited by John Kelly, or b) cognitive science, learning theory, and personalization. Accept that it’s a political project, even if, ironically, the point is to get “truth” out from under the politics. Ultimately, we’re not above it, and that’s ok. That’s our world. 1. I originally titled this post “Reflections on Fact-checking and Depoliticizing Politics”, alluding to a famous 1984 computer science paper, “Reflections on Trusting Trust,” by Ken Thompson. He demonstrates how even a simple computer program can be almost indetectably hiding a fatal bug, because a truly devious attacker can invisibly embed the bug or attack into the very tools used by the programmer. See the Wikipedia summary or the original paper. Ultimately, he suggests, security is a social process, of understanding and assessing the trust-worthiness of every party and tool you interact with, including yourself. 2. Overview of fact-checking. A history of the practice is under way by Lucas Graves, journalist and PhD student at Columbia. 3. Citation as evidence of bias. What if some fact-check source is cited more often by liberal/Democratic members of Congress than by conservatives? Then it might easily be proved to be liberally biased, according to the methodology of the best-known scholar of news bias, UCLA’s Tim Groseclose, as explicated in the leading peer-reviewed journal Quarterly of Economics (PDF). Agree? Missed something? Please send comments, suggestions to me at tim (at) tjm.org, or post on Twitter mentioning @mccormicktim, or comment on Facebook.